During the end of January 2012, 26 young people from the Richard Heathcote Primary School in Alsagers Bank took part in a project with Sambabybike, a new community music project based in Wood Lane. Sambabybike creates music and performance with community groups and promotes social change and environmental awareness. Joe said ‘Samba is a brilliant medium for encouraging any community group to listen to each other and work together, to balance fun and focus, noise and silence, letting go and concentration. The Samba kit can be moved about by bike or trailer – sometimes with my two year old daughter Hooli on board too! 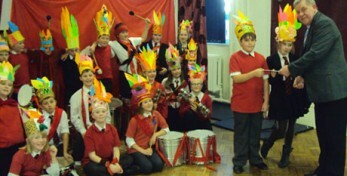 During five workshops, the Year 6 group developed team work, musical and performance skills and were introduced to the world of carnival and Samba by community artists Joe Wilson & Bianca La Rosa. Using the John Lennon song ‘Power to the People’ as inspiration, the young people explored the themes of power, revolution & community and created a piece for performance which combined drumming, dance, singing & costume. The project culminated in a performance on Wednesday 1st February to the children’s family, friends and other pupils at the school. Year 6 pupil Georgia Phillips reflected ‘We felt like a real team – no-one was left out’, while class mate Jacob Bentley-Green said ‘We blasted the roof off the school’ and Lewis Billinge described the project as ‘a fun packed adventure’. The project was funded by Alsagers Bank Cricket & Recreation Club. As a local Charitable Trust, the trustees are happy to sponsor and assist the local community where possible even in these financially difficult economic times. This is especially true when it comes to supporting the local school Richard Heathcote Primary and its pupils. Any project like Sambabybike that promotes fun while learning in a creative, self expressive, socially conscious environment while encouraging the pupils to work as a team, has to be a good thing. The trustees’ sponsorship of the Sambabybike project builds on the previous support they have given to the school in the past when approached for numerous library books by the then head teacher of Richard Heathcote Primary. The trustees feel it is important to invest in the future of the local community through the local schools and its pupils. Futhermore, the trustees wish Joe Wilson and the Sambabybike Project all the success in the future and they would recommend other schools who have not experienced the magic to do so.